If you ask an inbound marketer, inbound marketing is not only the best thing since sliced bread – it’s the saving grace of marketing in general. Now, I will admit to having some bias towards Inbound. I think it works a helluva lot better for today’s customers who are becoming increasingly resistant to the “hard sell” tactics of outbound marketing. But, it’s not the be-all and end-all, everything-you-need, one-stop-shop for SaaS success. Not even if you do it really, really well. Inbound’s strengths are in supporting the Awareness, Consideration, and Decision-making stages of the buyer’s journey. At its best, it reaches out to ideal customers, reels them in with genuinely helpful content, warms them up, and gently nudges them towards clicking the “Buy” button. “What else is there?” you might well ask. All of the stages inbound marketing typically addresses are about acquisition, which is great. You need to acquire customers or you won’t have a business. But you also need to retain customers – or you won’t grow your business. Inbound Marketing doesn’t do much, if anything, for retention – but your content strategy, together with your onboarding process, should. Because your goal isn’t just to attract and convert customers. You have to keep them too. 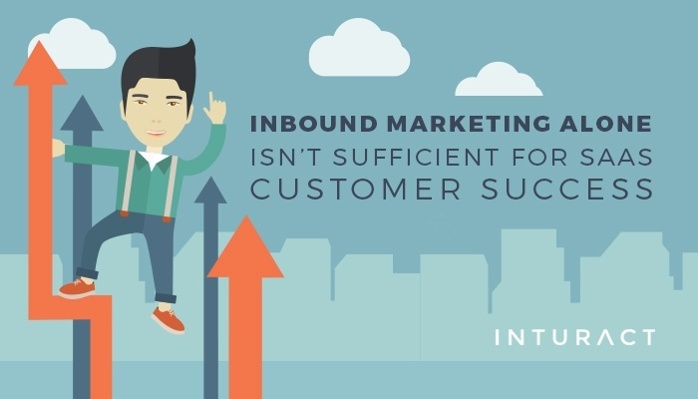 Inbound marketing – to date – has been about making that initial sale. But with more and more SaaS companies coming online with subscription-based models, SaaS content has to include retention strategies. It sounds good, right? But in most companies, this outline would likely find some pushback. Management, in most cases, is very fond of evaluating their sales teams, and gauging the success of their companies, based off of revenue – not Lifetime Value. Revenue is the amount of money you make in a month, a quarter, or a year. Lifetime value is the dollars-and-cents number you can attribute to each of your customers, both in terms of what they pay in recurring subscription dues, and in terms of the business they bring to the table over the entire time they are your customer. Think cross-sells, up-sells and referrals. When all of your customer acquisition effort and budget is spent just trying to replace existing customers who’ve left, growth is sluggish – if it happens at all. Focusing efforts (and budget) on Lifetime Value (LTV) requires a substantial shift in mindset. But, when you nail retention, you’ll find that acquisition rates rise, and revenue? According to Bain and Co., a 5% increase in customer retention can increase a company’s profitability by 25% to 95%. In a study of over 500 SaaS companies, Patrick Campbell, CEO and Founder of ProfitWell, found that increasing retention had a 6.71% impact on a company’s bottom line – compared with acquisition, which only had a 3.32% impact. Gartner Group found that, on average, 80% of a company’s future profits come from 20% of their existing customers. How do you retain a customer? Then, you actually succeed in having more people find your website and buy your products via Facebook. Are you likely to leave that company? No! That, at least, is the theory driving AdEspresso’s customer retention efforts. Since success for their customers isn’t actually the act of placing an ad on Facebook – they’ve gone one extra step to ensure that customers learn how to get the very best results from their ads by launching the AdEspresso Academy. Their academy doesn’t fit into the Awareness, Consideration, and Decision-making stages of Inbound Marketing – that is, it isn’t focused on bringing in new customers, instead it’s focused on keeping the ones they have. By investing in the real-world successes their clients care about most, their retention rates soar, as do their referrals. And, by producing so much genuinely helpful content, they attract new clients who want to learn how to improve their Facebook ads – who then find the AdEspresso product that helps them do just that. Hubspot has the same model, offering Inbound Marketing certifications for free and introducing marketers to their impressive platform at the same time. Hubspot also builds in success markers into their onboarding process, so that new clients can easily keep track of how they’re doing – and get help if they’re not meeting their own benchmarks. This is customer success in action. This is retention in the making. When every user has an entire World-Wide Web of choices, you have to compete based on the one factor that really counts: Do you have what it takes to help that user achieve his or her desired outcome? Loved this and all the stats. I learned a lot about this in a previous service based business in the early 2000’s (residential cleaning). We did tons of direct mail marketing that drove 25 appointments a week that closed at 70% or more. New customers grew fast the first few years but we didn’t watch the back door as close as we should and what eventually happened is the cost to acquire eventually doubled.